Autism is not rare, it affects 1 in 100 people in Australia. There is no known cause and no cure, but research shows early intervention makes a big difference to a child’s development leading to improved outcomes for children with autism, including higher intelligence (IQ), and increased social and daily living skills (Boyd et al., 2014; Magiati, Tay, & Howlin, 2012; Prior, Roberts, Roger, & Williams, 2011; Warren et al., 2011). Key elements of good practice in early intervention that lead to the best likelihood of positive outcomes for children with ASD have been identified through reviews of the research and are documented in the Australian “Guidelines for Good Practice” (Prior & Roberts, 2012) which AEIOU uses to inform its program. In addition, AEIOU draws from established evidence-based strategies (Wong et al., 2014) in informing the use of specific practices for each child. We have evaluated the outcomes of the AEIOU program and found improvements in autism symptoms, and increases in communication and daily living skills (Paynter, Scott, Beamish, Duhig, & Heussler, 2012) and continue to conduct research to further investigate and improve our outcomes. Our more recent research has also found promising results in terms of increases in everyday life skills (Vineland Adaptive Behaviour Scales), particularly around communication, decreases in autism symptoms (Social Communication Questionnaire), and increases in cognitive skills (Vivanti, Paynter, Duncan, Fothergill, Dissanayake, & Rogers, 2014). Young children with autism who receive the recommended early intervention have a much greater chance, later in life, of living independently, securing employment and developing meaningful and lasting friendships and relationships with long-term research showing benefits for children as they grow and develop (Howlin, 1997). According to a recently released report by Synergies Economic Consulting (2014), autism is costing Australia an estimated $8 billion a year in healthcare, social services and education costs, employment and informal care costs and burden of disease costs (quality of life impacts). The report showed that if the nation spent $118 million a year on early intervention for about 1,200 pre-school children with autism, who stood to benefit from the intervention, Australia would reap a total net economic benefit of an estimated $1.22 billion a year with a benefit cost ratio of 11.3. AEIOU is committed to ongoing research and development. 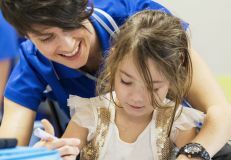 We were a founding partner of the Griffith University Autism Centre of Excellence (Griffith ACE) and continue to support a number of research projects. 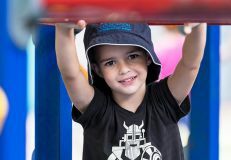 Further, AEIOU and Griffith University together supported the Cooperative Research Centre for Living with Autism Spectrum Disorders (Autism CRC) application which is the world’s first national, cooperative research effort focused on ASD, and today partner in a funding agreement in support of the program. In line with this commitment AEIOU has, over the past year, manualised its early intervention program in order to help measure and improve practice, enhance staff knowledge and application of best practice and ensure consistency in delivery across its centres. Importantly, this also allows us to measure against other services, enabling further ongoing research regarding AEIOU’s program and the futures of the children the organisation supports.